I am teaming up again with local art tutor Jay Nolan-Latchford. Join us for a beautiful circular 4 mile walk between Chenies & Sarratt, along the Chess valley. If the farm is open, you may get the opportunity to buy fresh watercress grown in the crystal clear chalk stream. After the walk, at Bojangles in Little Chalfont, Jay will guide us through a 2.5 hour watercolour workshop. It doesn’t matter if you’ve never painted. Jay is a very patient & encouraging teacher. She will bring out the creativity in everyone! Come for a wonderfully therapeutic day. 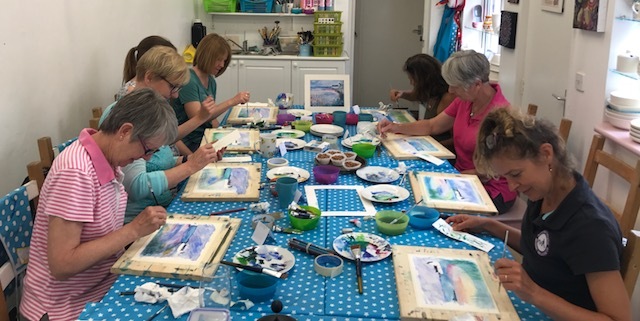 £32 per person, includes walk (with nordic poles if you want them), & all painting materials. Bring your own packed lunch. Next walk & ‘mixed media’ paint will be on Tuesday 28th May, as part of the Chiltern Walking Festival. Book via their website.